It's time to introduce to you the K-On! Dark Blue Theme created by the bubbly me! As requested by Rhycen, I have specifically made a "cool" version of a K-On! theme due to the others in the webstore being too "cute". So anyway, I hope you guys will like it! Give some suggestions on how it can be improved or give me new ideas for a theme! A nice comedy anime targeted at a younger audience but still captivates me to watch due to its funny moments, wide range of interesting characters and special ability wielding school students. Sakura Mikan and Imai Hotaru are best friends, and Mikan is shocked to find that Hotaru is transferring to a school in Tokyo for gifted students like her - Alice Academy. Mikan hears rumors that the students are like prisoners there, and worried what would happen to Hotaru, she runs away to head to the school herself. She finds out all the wonderful things about this school. And she heads into a great adventure!! 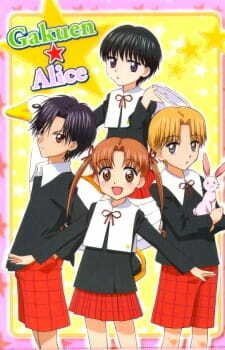 Gakuen Alice is one of those rare multi-genre anime targeted a a younger audience. The anime features elementary school kids that can use special abilities that study and live in an academy. The lot may sound simple, but there are many funny moments as well as sad ones. Somehow, the story got me hooked, I seem to love a good school based anime featuring school students with special powers. Probably just my thing. So anyhow, I really enjoyed the whole story from start to end. The art is not bad at all. Although it may be targeted at a younger audience, the graphics and visual style was like any other ordinary anime. Not so spectacular that it will blow your mind, just your average type anime. That said, there isn't really an ordinary anime out there to begin with. The places varied and the impossible is made possible throughout this anime. The voice acting as suspected was decent enough. As expected for elementary school kids, the voices would be all high-pitched. On the other hand, the opening and closing themes were nice and catchy. Nothing much else can be said about music in general. It was really generic really, nothing much stood out that made this anime better than another. Characters were aplenty throughout the series. Each character had a different background story and ability which made this anime even more interesting. Also, the relationships formed between characters are also well formed. There are also a wide range of characters from the elementary school kids to the high-school seniors. This makes this anime that much more interesting to have it contain a variety of age and genders. Overall, I enjoyed this anime from start to finish. The story was great, the setting was great and I loved all the characters. You may think this is just about kids at school, but I can assure you more interesting events happen throughout the anime that will definitely capture your attention. Loved the story. Would have been nice if there was a second season and more in-depth background information about the characters. Its simple and effectively illustrated. Well imagined and defy all laws of physics. Voice characters were average but the opening and closing themes were catchy. Wide range of characters can never go wrong in an anime. Different ages, genders, abilities, personalities and relationships are aplenty here. Enjoyed the whole series. I wished it was longer though. The abilities weren't explained properly enough so you may had to do some external research and guesswork. Its a good anime to have a laugh at and to enjoy casually. The surprises endlessly come and each episode is never boring.